This is a roundup of the best rated upright and recumbent Sole exercise bikes for Home and Commercial use. Sole exercise equipment is used in commercial settings and hotels (including Hilton Hotels). 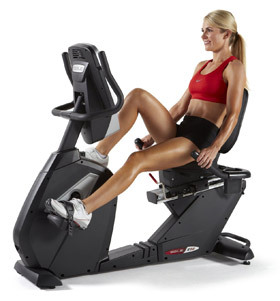 Some Upright or stationary bikes, are also called indoor cycles, with large heavy flywheels to give you the same experience as if you are cycling on the road. Exercise bikes provide an excellent form of aerobic exercise at home that you can do no matter what the weather is outside. Exercise bikes are easier on your joints with less impact than other forms of cardio exercise, such as running. You can compare Sole exercise bike below by features such as workout programs, reviews, maximum weight capacity, price, and other features. A glossary of terms is available at the bottom of this page. Light Commercial = These are Sole’s best bikes, designed for commercial or home environments. They are built to last and self-powered. Sole’s light commercial bikes include the Sole LCR (Recumbent Bike), and the Sole LCB (Upright Bike). Self Powered = Some of Sole’s bikes are self powered, which means that no external electricity is required to power the electronics and display. This is standard in the Light Commercial models.